There will always be two condiments or sauces in my fridge at home, tomato ketchup and brown sauce. 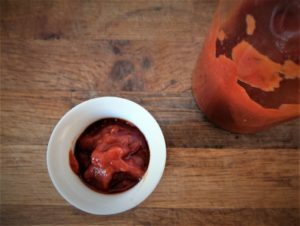 No matter where you are in the world tomato ketchup will be familiar but brown sauce may not be, in fact outside of the UK and Ireland you may not have even heard of brown sauce, so what is it and is it worth making your own? What Does Brown Sauce Taste Like? Let’s be honest, the name is not the most imaginative, it describes the colour and that’s it. It is not the most appetising descriptor either but when you taste brown sauce there is so much going on in terms of flavour maybe a name like, brown sauce was the only thing people could unanimously decide on. 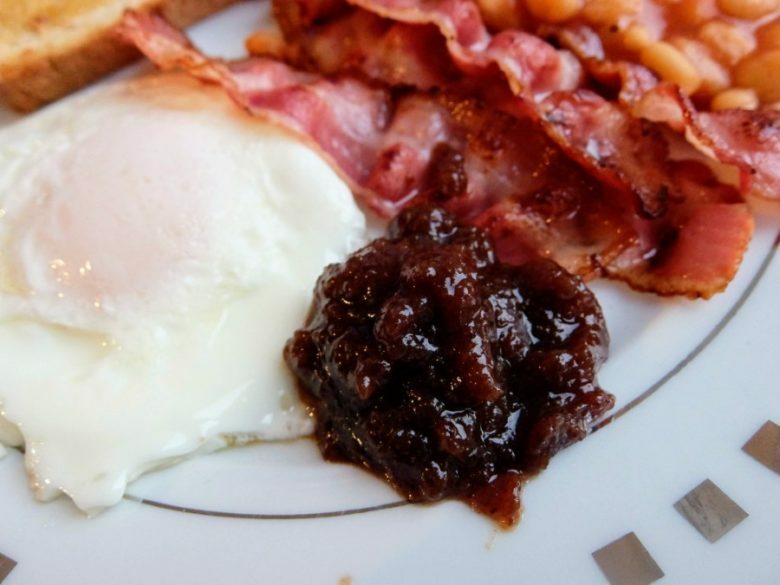 Brown sauce is a vinegar based condiment that is flavoured with spices, sweetened with dark brown sugar and body is created with dates and apple. The ingredients are simple but the flavour is punchy, tart, sweet and warming. It truly is something you need to try before making your mind up on. Brown sauce is primarily vinegar which means it is a preserve and will last a couple of months in the fridge. A little goes a long way but I always get through a bottle within 2 months. There are two camps, especially in the UK that are either for brown sauce or tomato ketchup. It is a binary choice for them and there is no room for the two condiments to share space in their fridges. I am more open and love both and see a place for each. I like a breakfast of bacon and eggs with brown sauce. The tart, sweetness cutting through the fat and complementing the salty savouriness of bacon. I think this is the perfect dish to have with brown sauce and it is worth making it for this alone. Dark brown sugar balances the flavour but still leaves some acidity. It also gives the brown sauce it’s colour. The vinegar and sugar together give the brown sauce a chutney like quality. Nutmeg, allspice and ginger are all in my recipe although I expect some recipes go further than this. These three spices in this brown sauce recipe add lots of flavour without becoming overpowering. Dates add two things, body and sweetness. Dates are full of sugar but also have deep flavour. In this recipe they are minced and add body giving the brown sauce a great sauce texture. Apple has a tart sweetness. 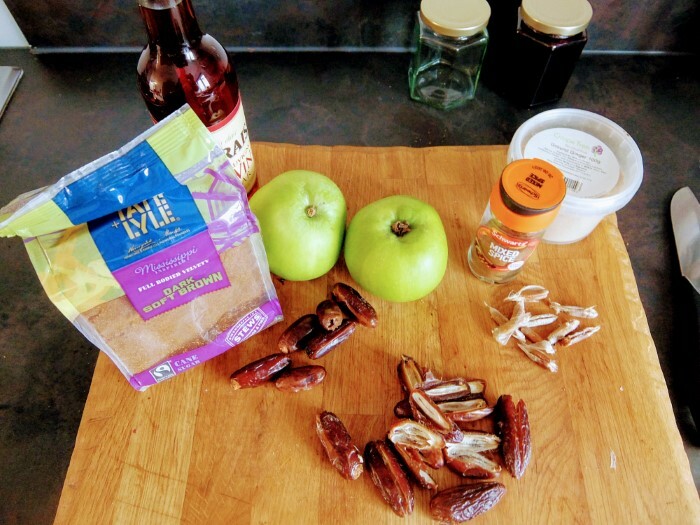 I have used granny smith in this recipe as these are good for cooking and still have a sour edge that works great in this brown sauce. Brown sauce is used much in the same way you would use ketchup, as a serving on the side of a dish. The taste is not the same though. 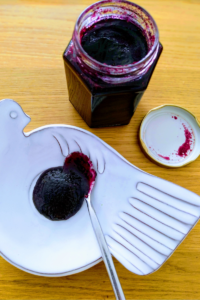 The flavour is much more acidic than ketchup with fruity, plum notes and underlying spice. It is a difficult taste to describe so I would recommend you make this recipe and try it for yourself. To begin peel the apples and core them before grating on a cheese grater. Make sure the dates are pitted and the stones have been removed. Chop into small dice. 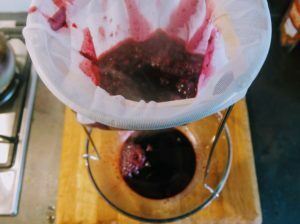 In a heavy bottomed pan heat the red wine vinegar and stir in the brown sugar gradually to avoid scorching on the bottom of the pan. 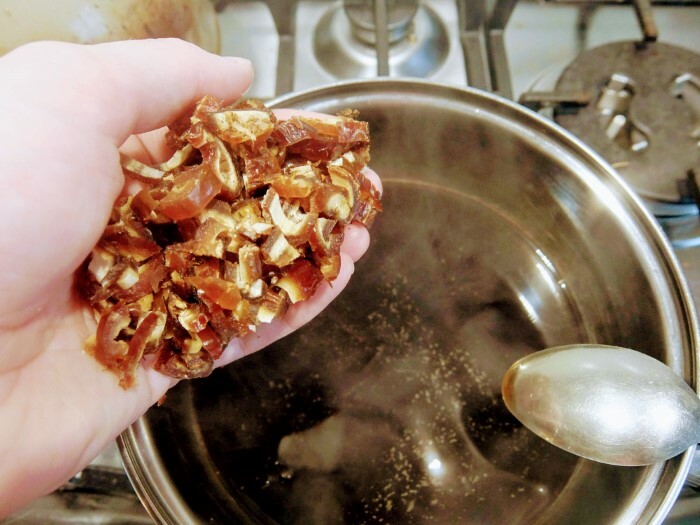 Bring to a simmer for a few minutes then remove from the heat. 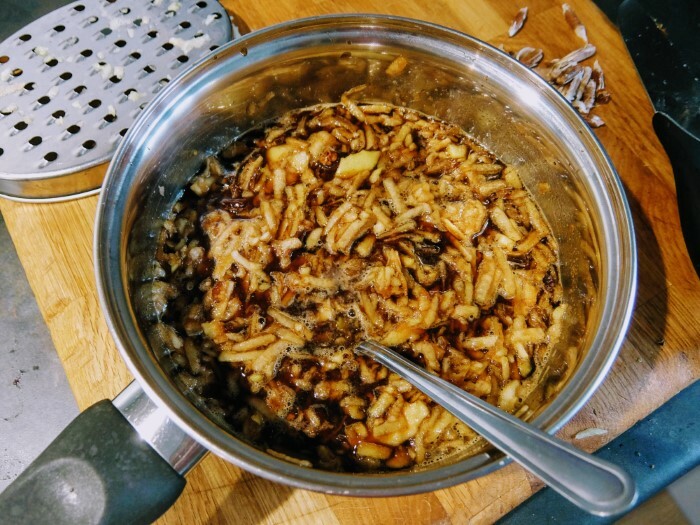 Stir in the grated apple, chopped dates and all the spices and leave to infuse for an hour, covered. After an hour remove the lid and heat the sauce to a simmer carefully ensuring it doesn’t scorch by stirring often. Simmer for around an hour until the sauce reaches a thick consistency similar to ketchup. Once thickened enough remove from the heat. Put the brown sauce in a blender and puree until really smooth. Pass the sauce through a fine sieve pressing it through with a spatula. Keep the sauce in a sterilised jar or bottle in the fridge. The brown sauce will last up to 2 months in the refrigerator.